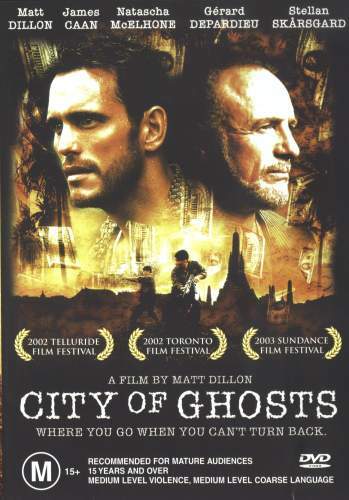 ��� I wasn't quite sure what to expect when I sat down to watch Matt Dillon's directorial debut, City of Ghosts, and I must confess that part of me is still uncertain about it. Dillon is an interesting, sometimes quirky actor who has been in some excellent films like Drugstore Cowboy, some great trash like Wild Things and a certain tasteful and delicate movie involving someone called Mary... I suppose when I think of it, that same description suits this film, although I must confess its quirkiness was something of a double-edged sword - it makes the film interesting enough to watch, but prevents the audience from really ever caring about what was happening, in spite of the efforts of a talented cast including such acting pros as James Caan, Gerard Depardieu and Stellan Skarsgard. I suppose though that what was going on was never really the central concern of the filmmakers, rather it is how it is going on that holds our attention. ��� This is, according to my information, the first film to be shot almost entirely in Cambodia since the wonderful 1965 film Lord Jim starring Peter O'Toole who will next appear in the megabudget movie leviathan Troy which opens nationwide soon. Like that film, and the recent The Quiet American set in 1950s Vietnam, City of Ghosts positively drips with atmosphere and intrigue. Weird and wonderful characters abound, chewing the scenery with obvious relish. The decaying French colonial architecture nestled amongst Buddhist temples and sweltering tropical forests - all mists and shadows - provides an eerily exotic backdrop for this film that revels in its plot convolutions. It makes the New York setup and Dillon's character Jimmy's flight to South East Asia all seem arbitrary, but once we're there, confronted with Depardieu's boorish innkeeper, Caan's enigmatic 'businessman' or Sok (Kem Sereyvuth), the rickshaw driver and trusty sidekick to Jimmy we sort of forget about the believability of what is happening and enjoy the pulpy offerings. ��� This film was obviously a labour of love for those involved in its creation. We should be thankful that there are enough talented people in the film industry willing to try something a little different. City of Ghosts may not be a great film, but it's not trying to be. It's like taking a detour or nine through a fascinating part of the world and having all those expectations of adventure and intrigue being rewarded. You may not do it again in a hurry but the trip was worth it. ��� This is a good transfer that certainly doesn't detract from the exciting visuals of the film in any serious way. Remembering that it was a low budget film shot in difficult locations (well, compared to Hollywood soundstages and back lots anyway) I was quite pleased with how everything panned out. It is presented at approximately a 1.85:1 aspect ratio, 16x9 enhanced, which I believe to be very close to if not the actual original ratio. ��� Sharpness was uniformly good. Blacks were clean and clear and shadow detail was excellent, sometimes outstanding, which really surprised me I must admit. There were frequent night scenes and never was the onscreen action masked by insufficient detail. There was little low level noise and grain only crept in on a few occasions. ��� Colours are not your typical Hawaiian vibrant - clich�d if you ask me. Instead, we get a subtle and slightly cooled palette that suits the mood of the film very well. The nightclub and brothel scenes are laden with meretricious reds and greens, and the frame sometimes looked oversaturated, but I wondered whether it was more an artistic choice than a fault with the transfer. Skin tones were, a few scenes excepted, well rendered. ��� Film to video artefacts weren't a significant problem, although some examples of MPEG artefacts are noticeable at 4:32, 7:08 and 39:06. Aliasing is minimal, and only of real concern at 46:58. ��� Film artefacts are also kept to a relative minimum (some examples can be seen at 38:52, 58:16 and 92:10). ��� Overall, a commendable effort, especially considering the origins of the film. ��� The audio is of a very good standard. We get the choice of 5.1 and 2.0 English surround tracks, and not surprisingly, the 5.1 track is by far the more impressive and was the one I selected to view the entire film with. ��� Dialogue, in spite of a myriad of accents articulating English - French, Swedish, Cambodian - was clear and easy to understand. Audio sync was excellent. ��� The subwoofer is not used particularly often, but does lend some depth to the natural ambience of some outdoors scenes, which also provide the surround speakers with a bit to do - bird calls and bats a notable feature. ��� Audio distortion of any kind was not a problem, although at 24:10 part of the musical soundtrack masquerades as a problem until the ear adjusts. I should make mention of the dreamy scoring of composer Tyler Bates whose music is a key ingredient in this concoction of South East Asian exoticism and intrigue. ��� The extras included, like many low budget films, seem a little amateurish in content and presentation but they are worth a look. It is shame we don't get an audio commentary from Matt Dillon as he, as the driving creative force behind the film, would have provided a lot of insight. As it is all we get is a 3:11 montage of behind the scenes footage that reveals very little and roughly four minutes (no timed chapter on the disc) of a journalist interviewing Dillon on location, with four unnecessary breaks showing the question onscreen before Dillon answers it. ��� The filmographies are pretty standard, whilst the trailers included, all not 16x9 enhanced and at differing aspect ratios, are for some pretty perverse looking films. A gallery with a few shots doesn't add much to the understanding of the film either. that all important audio commentary from Matt Dillon and co-writer Barry Gifford. Trailers for Savage Messiah etc. ��� If you are a fan I would suggest the Region 1 is probably the better choice, although cost and the standard NTSC/PAL differences must be taken into account. Your call. ��� All in all, City of Ghosts is a film worth seeing for a chance to experience the relatively unknown world of Cambodia. The plot is merely designed to get us to detour through what is an amazing country and meet some eccentric characters. ��� The video quality is very good. ��� The audio suits the film well though a more immersive surround track would have enriched the experience. ��� The extras are limited and sorely miss an audio commentary from actor/co-writer/director Matt Dillon. Display Sony 76cm Widescreen Trinitron TV. Calibrated with THX Optimizer. This display device is 16x9 capable. Audio Decoder Built in to DVD Player, Dolby Digital and DTS. Calibrated with THX Optimizer.